Finding the right sofa for your row house can be a challenge. Small and/or oddly-shaped rooms are something quite a few row house dwellers have to deal with. Sometimes the room is long and narrow, or there are stairs against the only wall big enough for a sofa. And if you do think your wall is large enough for a sofa, you find that when you get to the furniture store, everything is two inches too long. It’s no wonder that RowHouse gets a lot of email about furniture options. We often champion the flexibility and ingenuity of the row house dweller. There is no time this is truer than when furnishing a row house, especially with large items like a sofa. To be able to combine design and function in an often oddly-shaped space seems like an impossible dream, but it can be done. Perhaps it’s your first home and you had lofty decorating ideas you got from House Beautiful. Or, perhaps you planned on living in another home and find yourself unexpectedly in a row house, a smaller row house. If the reality is that you now occupy space-challenged rooms, you may have to throw out your original ideas about what your dream living room should look like. Make a list about what really defines your style in terms of fabric and texture – things that are flexible in their application and project that on what actually fits in the space. For example, you may love the 1970s casbah look and desire a dreamy, massive velvet sectional. However, your new living room is roughly seven feet square. You may have to get a small, modern sofa. However, you can recover the little sofa in the velvet that you love and use throw pillows to add the texture. Don’t forget color and art. 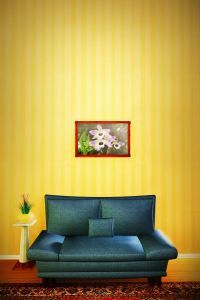 Sometimes you will need to get functional (boring) furniture but color and art take up very little space and can set the mood beyond what a singular piece of furniture can do. If you can sit on it, it’s seating. Perhaps you often have a dozen people over and can’t fit permanent seating for 12 in your living room without blocking the door. Upholstered ottomans provide seating and storage, comfortable dining room chairs can be moved from room to room as needed, and floor cushions, which can be stowed under the bed when not in use, are all flexible seating solutions. When people come over, pile everything into your living room. When people leave, you can put things back so you can move around your house, and escape, freely again. Keep in mind everything people could sit on in your house and you might have more seating than you thought. A sofa needs to be comfortable. What it looks like is secondary. It could be the most beautiful sofa ever, however, if it puts your guests in physical distress, it’s not a very good sofa, is it? If you host overnight guests often and do not have a guest room, you’re going to want to make sure it’s comfy for sleeping on as well. Additionally, decide what the function of the room is. If you have people over every week, you may want more permanent seating options. If you don’t have people over all that often, it may make sense to borrow pieces from other rooms for when you do entertain. This blog post on Andie Day Lifestyle offers several small living room ideas. We love the last photo. This blog post on Nice Space shows another two rooms that could be row house living rooms. The first, with the sofa against the stairs, is very typical of row house living rooms. Real Simple Magazine often shows creative ideas for small spaces. This example is from a room that’s only 11 feet wide. Forgive the ads on this page, but the picture shows a smaller love seat with an armchair and floor cushions, which is a great way to have flexible seating.